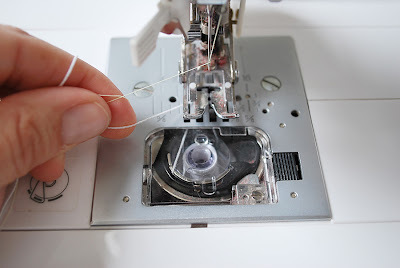 Below is a tutorial on how to shirr with elastic thread. Before we begin, I must mention that this is a compilation of shirring techniques which I have learned from 3 specific resources: Portabellopixie, Craftstylish, and Heather Ross's book Weekend Sewing. 1. Finish the upper raw edge of the bodice. I like to finish it by making a casing for a 1/4" elastic band. If you have 2 separate pieces (bodice and skirt) sewn together, you can turn the seam allowance into a casing for an additional band of elastic at the waist line. Simply finish the raw edge of the seam allowance and sew the edge of the SA to the bodice. After I have shirred the fabric, I then thread the elastic through the casing. This helps maintain and reinforce the shape of the garment. For now, just make the casing or finish the raw edges. You may want to mark your shirring lines on the fabric before you begin. Its recommended to mark every 1/4" to 1/2". 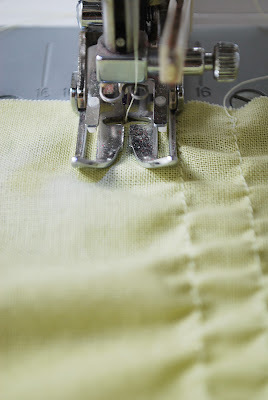 I use my sewing foot to mark it (eyeball it), which works just fine for me and eliminates a step. If you are going to mark your fabric, mark the right side of the garment (visible side of the garment). Also, use tailors chalk, disappearing fabric ink, or some sort of erasable mark. 2. 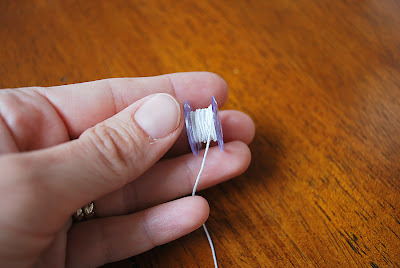 Wind the bobbin by hand with the elastic thread. It is very important not to stretch the elastic thread as you wind it. This is why you must do it by hand. There can not be any tension in the elastic thread. 3. Insert your bobbin into your sewing machine as you normally would. 4. Pull up the elastic thread as you normally would for regular bobbin thread. 5. I like to shirr with my walking foot. If you do not have a walking foot, then a regular foot will be just fine. 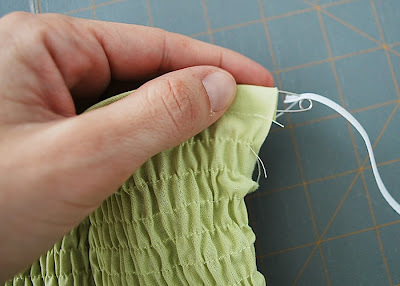 With the right side of your garment facing up (elastic thread should be on the side that will not be visible on the completed garment), begin to take a few stitches, then back stitch to secure your thread. Stitch from one end to the other. 7. When you get to the end of your first row of stitches, back stitch and clip the threads. Turn the garment and begin sewing your next row the same way you did the first row. 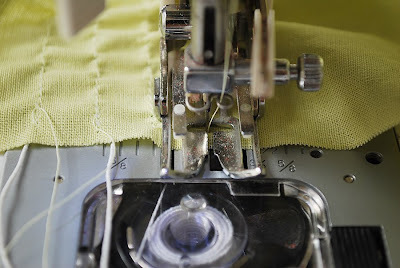 Another option (which is quicker) is when you get to the end of your first row of stitches, lift the presser foot, move the fabric over so that the needle is positioned over the next row. Lower the presser foot and needle. Pivot the fabric. Begin sewing the next row of stitches. Always back stitch when you come to the end of the elastic thread and make sure you have enough thread to complete a row. You may notice your first couple of rows don't gather as much as you'd like. Don't worry. As you continue to stitch more rows, your garment will gather more. 8. When you have completed shirring/smocking your garment, spray it with water. You will see your garment gather up nice and tight. Press your garment gently. Do not smooth the iron over the garment. Lightly press the gathers. 9. Thread your elastic through the casing/casings. 10. Stitch the elastic band ends to the garment. Update: The Honey Girl Dress/Top sewing pattern (shown above) is available at Phat Fabric. Here's the link. Wow, i love your blog and this one is really informative! Thanks! Now I want to try this on a beautiful summer dress! How much allowance or fullness did you allow? I mean, what measurement did you start out with, compared to your bust measurement? Like, double? Brandi - The good thing about working with elastic thread is that you don't have to be accurate in your measurements. For this type of fabric, double would likely be too much fabric (this fabric doesn't gather as much as a stretchy light weight cotton). My bust measurement is 35" and I cut 2 separate strips at 22" in length (each). I hope that helps. Oh thank you for this tutorial! I was looking into books on how to make this and ta da you made a tutoria! I love that celery sun dress! Oh any shop update soon? :) Have a lovely merry happy day and love to you! What a gorgeous dress! Thanks for the tutorial! Once I'm going to make this dress. I adore dresses, but as I am a breastfeeding mom I would be showing of a little too much while feeding. But once, once, I will be in dresses all the time again. Cute dress! Jamie, your tutorials are the best - very detailed. Thank you for sharing them. I've always been curious about sewing with elastic thread. jamie, you are brilliant! i can't stop thinking about this dress. you could sell these like crazy out of your etsy store! Wow...thanks for the tutorial! I didn't realize this was so easy....I can't wait to give it a try! Oh yay...looking forward to your shop updates! Really looking froward to your aprons and dresses! Have a wonderful weekend! Love to you! Thanks for the really clear tutorial! I bookmarked it and hope to use your instructions sometime. Very cool blog as well. I love the dress! Thanks for the tutorial. I think I might give it a try when school is over. Do you do anything with the tension--either bobbin tension or the upper tension? Thanks for the super clear tutorial! Thank you, thank you, thank you! The pictures combined with the way you explained it gave me the ah-ha! I've been needing...I can do this! YAY this is fabulous! Thanks so much for posting this! I'll be linking and I can't wait to try this. Smocking is so pretty on Summer garments! I've always wanted to know how to do this and know I do! I'm excited to try! i'm linking to this post! Gee Brain, you're a genius! Why didn't I think of the 1/4" elastic at the top? I remember wearing these when I was a teen and hated the ruffled top under my arms. This solves that problem. Now I can't wait to make one! Wow! Your dress looks fabulous! 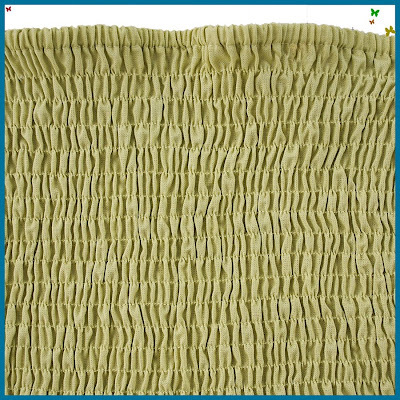 I have never tried smocking before. It looks so complicated. Thanks for sharing - now I know it is actually very simple! 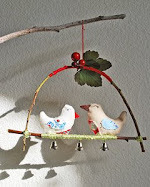 I will make a few of these tomorrow with a fifth grader who really wants to make a dress for her mom for mother's day. It's hard to find sewing that kids can do almost by themselves and this is all straight lines. I nominated you for a Kreativ Blogger award. I absolutely love what you do and am very grateful that you blog about it. The rules, and what I wrote about your blog can be seen on my blog. walking foot= genius and also why didn't I think of that? It would help me so much in keeping everything straight. Man- I used my walking foot for eveything last summer and can't imaginie why I didn't think of it the other day when I kept crossing lines. Even though I plan to attatch straps to these dresses, I love the idea of the elactic at the top; it would eliminate the weird ruffle action that always happens and add that much more support/staying up power. Also, I have this idea to make a straps optional verion of this for a slighty less endowed friend and I know she would appreciate the elastic. Great tips and the dress is too cute- I love the faux tuxeduo part. I love this! Thanks for the help on shirring!!! Cute dress too! Sorry if this is redundant...Did you used a 35 inch wide piece of fabris or did you use say 37 inches b/c your bust is 35 inches? I want to surprize my girls tomorrow with new dresses so I want to make sure I know what I'm doing. For the bodice, I cut 2 separate strips in length at 22" each. The pattern should be completed by the end of next week. Cute dress! I made a smocked dress with this method recently but the elastic on the top is a great idea. I absolutely ADORE shirred tanks for summer!! And can't wait to try this out. Gonna go bust some stash with this tutorial!! Question though, I'm a *ahem* bigger girl, so I can't go without straps. I assume one would attach the straps after shirring to make sure they don't migrate when the elastic contracts? I was having problems with my tension and from your pictures realized my bobbin wasn't set right. Thanks for the great tutorial! great tutorial! i have tried it and it is not "bunching" right? is there a suggested fabric to use? i asked the lady at joann fabrics and she directed me to the cottons but it is pretty thick and stiff?? any suggestions? Hi Lisam! There are several reasons why your fabric may not be bunching right. Try winding your bobbin again, making sure you have absolutely no tension in the elastic thread as you wind it. 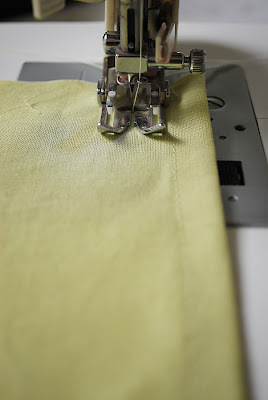 If the fabric is not bunching, try sewing your shirring lines closer together. Also, spray water on it when you're finished shirring. It will scrunch up your fabric. This is the 3rd page I've viewed and thank goodness you are out there. It was very informative, helpful with easy step by step instructions. I've never 'smocked' before and did not know where to start and now I'm sure I can do it. Thanks!! SOS Jamie! I tried this today without success. I followed your instructions to a tee but my fabric bunches up as soon as I sew a line. This makes it hard to shirr. Hmmm it could be your bobbin holder or it could be the fabric. If the fabric is light weight it may be shirring up too tightly. It kind of sounds like that, because I encountered the same problem and my shirt, and it was pretty tight (teeny) when I was finished shirring. If this is the case, try winding the bobbin with some tension. This will prevent the fabric from shirring up too tightly. If it is your bobbin case, I don't know what to tell you. I have never worked with a machine like that. However, it does sound a lot like the problem I had and winding the bobbin with tension should fix that problem. Test it out on a piece of scrap fabric (from the fabric you intend to shirr on). I hope that works for you. Thanks for a really easy to understand tutorial (I know I'm a bit late since you posted this in April but I just found it). I just shirred a dress that was too big and it turned out great thanks to your instructions. Your blog is fabulous too. Can I link to your turorial? Your welcome =) Yes, you can link. Much appreciated. Hi! You shouldn't have to adjust your tension at all. Your tension should be at the factory setting or auto. If anything it could be the way you are hand winding the bobbin. I suggest starting all over. Begin by hand winding the bobbin with the elastic thread. Make sure there is no tension in the elastic thread as you wind. Insert the bobbin as you normally would. Pull up the elastic thread. Before you take you first few stitches make sure your tension is on auto or normal. Sometimes you just have to start all over and re-wind the bobbin. If that doesn't work then it may be your machine =( Not sure. Do you know how partial shirring is done? I have been looking everywhere for a tutorial, but can't find one. I'm wondering if the shirred bit of fabric is sewn with elastic thread before the construction of the garment, or if the shirring is done after the garment is put together? I'm a novice dressmaker, and I can't figure this one out! That was so what I was looking for! Anthro and the back of the skirt is shirred only at the center back (about 4" of shirring). After inspecting it, I noticed the fabric was first shirred and then sewn to the garment. However, I have noticed other garments with partial shirring and it was done after the garment was completed. I would just make sure to backstitch and possibly knot the thread tails when partial shirring. I am having trouble with my elastic bobbin.... the first two rows came out perfect (with a few spots loopy) once i got towards the end of the bobbin, the elastic thread stared to unravel and bunch up causing a big knot with both threads. is it possible the thread is too loose? i dont think it is too tight since i barely guided it? also, does it have to be wound up perfectly in line like it is when your machine does it? i tried to rethread another bobbin and now it's not working at all??? Lisam - Possibly your elastic thread was wound too loose. I do guide the elastic thread as I wind it by hand, but it's not perfectly wound like it would be if the machine wound it. Make sure your top tension is on auto. Most of the time, the top tension has been fiddled with, thus causing problems. Also, try switching out needles, so that you are using a brand new needle. I just used your wonderful shirring instructions - thank you, they are perfect and just what I needed to finish my little girls dress. I know this is an old post, but I have another tip. Instead of spraying water, then ironing - you can just use the steam setting on your iron, and pump hot steam on the shirred section. It should ruffle up pretty quick. I've been making skirts and dresses for little girls for years, and it's one of my favorite ways to add some design interest. Sadly I did all the prep for this sort of shirring and then discovered that my basic machine won't do it. I have a Brother BM 2600. I don't have a walking foot either and they are expensive to purchase, esp if it doesn't work. I think I'll have to borrow a machine from someone. FYI....and the reason Amanda's didn't work. Brother machines do not do this properly. Was having so much trouble; did some research and the common denominator with everyone having this problem was the Brother machine. Looks like we have to buy an extra bobbin casing and change the tension on that. What a pain! At least I know it's not me though! Thanks Reagan! Can you tell us what type of bobbin and how you changed the tension. Thanks again. I'm sure this will help out a lot of people. just found your blog and this wonderful tutorial. I'm making a christmas gift today using this technique, hopefully it turns out fabulous, thank you! OMG I have tried everything to get this to work, and like so many others having problems, i have a brother machine. This is so disappointing because my machine was $1100!!!! My elastic is looping underneath, i have wound and re-wound the bobbin and have left the tension as is, and also tried adjusting it both ways. 2 reels of elastic thread and I'm still tearing my hear out! I love this tutorial! This will be great to make some summer dresses with! Very nice tutorial - thanks for sharing! Hey great tutorial. I just happened to stop by here when trying to find out about shirring on clothing patterns that do not call for shirring. Do you know. . . I am sewing a little girls dress and I just want the top and arms to be shirred instead of with elastic. Can I shire just a few rows and it work? Thanks!! Hi. I just did some searching because I was having trouble with my Brother 7700. The elastic thread was very bunchy in the back. Apparently there is no bobbin tension on this machine so I had to create my own by lightly placing my finger on the bobbin as I fed the dress through with my other hand - tricky work but the dress is well shirred now. this gives the illusion that there should end up with a stretchy area...when i've been shirring that is not the case...am I doing something wrong or is this just an illusion? Thank you so much for the tutorial!I am new to sewing, but I think I am going to give this a try. I already bought the fabric! i had a quick question (which I didn't see already answered--sorry if I missed it). -Should you basically sew your entire dress together and then shirr or do you shirr them and then sew them together. I guess I am having trouble picturing how you would do it once the dress is complete...keeping the shirring lines straight as you go around the tube of the dress. I'd love any pointers. Stonehouse - Yes. I have shirred just one row of shirring around a sleeve and it worked. Amy - Yes, the fabric should be stretchy when you've completed the shirring. Are you using elastic thread? Make sure you don't have any tension in the bobbin thread (elastic thread) when winding it by hand. Also, your bobbin tension should be at the regular setting. If at the regular setting it still doesn't shirr, begin increasing your bobbing tension until you see it shirring. Sometimes it takes quite a few rows of shirring before it actually bunches up. The Keylors - You can shirr after sewing the dress together, however, I prefer to shirr the dress or top in 2 separate pieces (front and back) then sew the 2 pieces together. 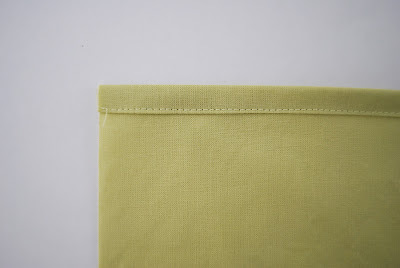 This way I know the elastic thread is secured in the seam allowance and it is easier to keep the shirring rows straight. I have sewn one side of a dress together and then shirred across the the dress. Once I had completed the shirring, I sewed the opposite side together. That helps a lot! Thank you so much for getting back to me so quickly! Thank you soooo much for this wonderful tutorial!! Great tutorial. 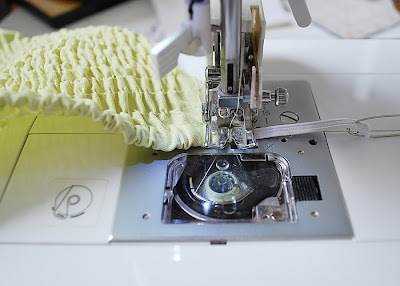 Saw your sundress on Sew Mama Sew and popped over to see your blog. 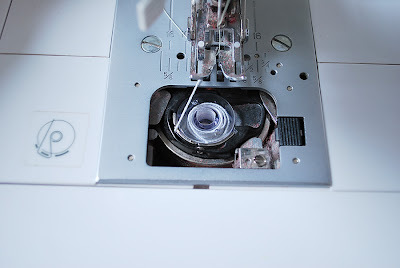 Can you tell me, does the elastic in the bobbin go through the bobbin tension guide? Thanks. Great question Cindy! Yes, it does - just as you normally would with regular thread. I will say that not all elastic threads are created equally. I would recommend buying 2 different brands of elastic thread and then do a test run to see which shirrs best. I had one lady that was having a lot of problems shirring, so she purchased a new brand of elastic thread and it made all the difference. Hi I have a brother with drop in bobbin. Basically, with brothers, you should set your stitch length to the longest and bobbin tension to the shortest. Shirr everyrow neatly pulling fabric straight. Finish with steam. Thanks just what I needed to make a sundress for my niece and her friend. Joann fabrics had very little of the ready made stuff so with this tutorial I will attempt my own! Thanks for the tutorial. Hi- Loved your shirring tutorial! I had one question. I typically preshrink all fabric before sewing anything... but with the shirring and using water and/or steam to create the gathers, do I NOT prewash/shrink the fabric before I make the dress? Or, at least before I do the shirring? After the dress is made, should I avoid putting the finished dress in the dryer (even on low or tumble dry) because of the elastic? I just left a comment and forgot to ask something. Am I to assume the size of the machine stitch for the shirring should be my largest 'basting' stitch? Thank you! I have a VERY old Singer Genie from the 70's that doesn't have any fancy stitches on it! But, it still works great after all these years! I suggest pre-washing your fabric first. This way there will not be any surprise shrinking. As for using the dryer, it depends on the type of fabric you are using and not the shirring. If you are using a cotton fabric, you should be fine with using the dryer. Use your regular stitch length. You do not need to use the largest stitch. Thanks so much for this tutorial! I am a VERY novice sewer, but with some help I am hoping to recreate an amazing shirred skirt that I have with some fabric I got on a trip to Africa. I wanted to do something special with the fabric, and I would love another of these skirts, so it seems like a win-win. I have a few questions on how to adapt this tutorial for a waist-height, above the knee, shirred skirt. How much fabric should I use, compared to my waist and hip measurement? (The fabric is a basic cotton, but not very stretchy). Also, do I shirr one panel (to become a "waistband" of sorts) and then sew that to the rest of the skirt? Also, if the bobbin has elastic thread, does the top spool have regular thread in it? I am confused about that part. Thanks for answering my beginner questions. I'm planning on making a trial skirt with some old sheets to see how I do before using my special fabric. Looking forward to all of your insights! I will try to answer your questions as best possible. ~ As for how much fabric you should use is really a matter of trial and error. Generally, it is recommended to double the desired finished width. First questimate and then make a sample out of scrap fabric. You can shirr one panel or both. Check out skirts at you favorite store or online and see how they do it. It's really a matter of preference. ~ Only the bobbin thread is elastic. Not the top spool. the top spool is the thread that will be visible. First, I cannot believe you have a post that is going on over a year- that just shows you what a great post it is. The instructions are great... I just have a quick question. I hope you can help. Any ideas?? Thanks so much for you awesome advice! Hmmm... the first thing I thought of was your thread, but I see that you have tried different threads. By different threads, are you referring to elastic thread or the bobbin thread? If you haven't changed the elastic thread, then try that. There are some really bad brands out there that don't have much elastic to them. If you have tried different tensions and thread (both bobbin and elastic), then I would suggest taking it to the sewing machine repair person. Maybe your machine is off? I'm not to sure. If you figure it out, please feel free to come back here and post the answer. Possibly others have had the same problem. If I find out the answer, I'll be sure to post as well. I hadn't even thought of changing the elastic I was using. Great idea. I will try that and see if that makes a difference. Do you have any additional info on this? Or maybe point me into the correct direction? This is a great tutorial. I have limited sewing experience but want to make myself a maxi dress out of cotton jersey, with shirring around the bust. I will also be attempting this without a pattern! I have until May to complete it, so will take my time. Thank you so much for your tips, I feel confident that if I follow your instructions, I'll be okay. Your tutorial are so descriptive. Thank you for sharing ! I just completed my jewelry course and looking for tutorial on making of different kind of jewelry..DO you any tutorial for it. I would be more than happy if would share with me..Waiting for your reply. I just found your tutorial after searching for days for an answer to my question. I have a pattern for a dress, that does NOT call for shirring. I want to shirr the back bodice piece so that this dress will fit my daughter much longer, dress into a shirt type thing. Do I have to change the measurements of the bodice piece or can I just leave it as is and shirr it? Also if I am only shirring the back piece would you advise on shirring it first then attaching the rest of the dress, or last? It seems it would be easier to shirr first. Thank You! And great tutorial! Hi Lynsie - If you are shirring just the back bodice piece then you shouldn't have to change the front bodice, assuming you are altering the width and not the length. I would shirr first then sew the side seams. Joan - Thanks for the info. 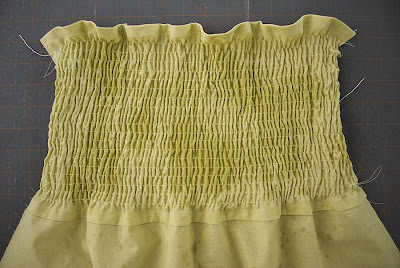 I thought I had changed that when I changed the title from smocking/shirring tute to just shirring. It should be good now. Thank you so much for taking the time to make a great tutorial! I've wanted to learn how to do this before but never googled it...didn't really know what it was called. Thank you again!!! Wow. you make it look so easy! Thank you for the tutorial. Finally tried it-- and it worked perfectly! I have a super old machine so I did have to adjust the bobbin tension manually. So happy with the way my dress fits! Hi! Great tutorial. However, I ran into a disappointing problem. I did everything (I thought) as I should: no tension with elastic thread while hand winding the bobbin, cut fabric double the width of my bust, etc. However, my dress turned out SO tight that when I tried to put it on, a bunch of the treads broke. It did not have enough stretch. I've googled this and can't seem to find an answer. My best guess is that as I shirred, it gathered A LOT and so it started almost creating pleats, too, in between the rows of shirring. Do you stretch out the fabric as you're shirring to avoid this? Thank you! I suggest winding the bobbin with tension. The tension will stretch out the thread, which will not gather the fabric as much. Gina - Also, be sure to test on a piece of scrap fabric. Different fabrics respond differently to shirring. I know that if you pull on the elastic thread as you wind, fabric tends to not shirr. My thinking is that if your fabric is shirring too tightly, then pulling on the elastic thread as you wind should help solve the problem. Just wondering how wide my fabric got to be for a size 12 ladies dress! I am trying to use the elastic thread to make the Lily Top from Pink Fig and I have followed other instructions and the pattern instructions, even looked in my sewing machine manual (Brother CS6000i)and the elastic thread on the bobbin keeps getting tangled and I keep having to stop and start over. I wound the bobbin by hand, not too tight, not too loose. What would cause this? Getting very frustrated. 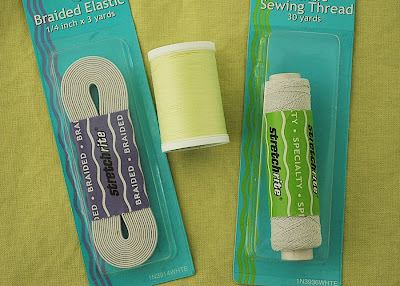 Have you tried another type of elastic thread? There are some pretty bad elastic threads out there. In my opinion everybody must go through it. Thank you so much! I could never figure this out before, now I think I'm ready to give it a new try. Seems so easy if you know how to do it! Thank you so much, this was a great tutorial to follow and it worked like a charm for me! The dress is really awesome! Thanks for the short and understandable tutorial. I gotta try to make this one! It worked! I bought a yard of fabric, cut it in half to make 2 panels 18" x 36", sewed them together then shirred the part over the bust to make a comfy shirred top. Thanks for the clear instructions - I'm now ready to try a dress! Thank you so much! I've always wanted to learn to perform this method of sewing. I realize it's been a few years, but this just came in right time for me. I can't wait to give it a try. I just came over from the Fiskateer site! What a great tutorial! I have always wondered how this was done, now I know! I am searching for this such an awesome time continued back. Thanks for team! Thank you! Lovely clear explanation. Am going to try a shirred summer dress for my little girl. just find a good video converter to help to do so, such as aiseesoft video converter for mac is such a tooll which I have been using for a long time for convert mp4 to mov for editing and insert to powerpoint. just have a try at: http://www.ivideotool.com/ . good luck!! as soon as you could be liberated to the last with this particular key deny regarding occurs, enhance the presser ft, go on your own methods Glendale Carpet more than to make sure that your own connect is definitely set following deny. Reduce your presser ft and in addition connect. it's so creative. Good job! Wow, wonderful blog structure! How long have you ever been running a blog for? you made running a blog look easy. The total glance of your site is wonderful, let alone the content material! Thank you for the information. You have a very good article. I found it informative and useful. Keep up the good work and God bless! Hi, I tried to do shirring the other night and it was a complete failure. The fabric didn't bunch up at all and I'm wonder what is it that I'm doing wrong :( I am using a Singer heavy duty sewing machine with a cotton fabric. Any advise? Help would be very much appreciated. When you have finished shirring/smocking your piece of clothing, splash it with water. You will see your piece of clothing get together pleasant and tight. Press your article of clothing tenderly. Try not to cover the iron up the article of clothing. Delicately press the accumulates see. This is a Flickr badge showing items in a set called Sewing and Crafts. Make your own badge here. All apron designs, tutorials, patterns, and peg dolls are original creations by Jamie Christina. Creative content on this site may not be used, copied or transmitted without the express permission of Jamie Christina. Please email jamie@jamiechristina.com.